ments, and search for documents in the document library. When adding a new document, you enter the filename and location for the document, specify the owner and status (for example, Draft, Reviewed, Final, and so on), and enter any pertinent comments. You can also associate a document with specific tasks if you want. After the project server administrator sets up and configures Windows SharePoint Services and the Document Library specific to your team, you can see documents directly from your Microsoft Project Web Access site. 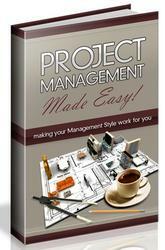 New in Project 2003 is version control. Document versions can now be controlled using check-in and checkout processes. If a document is checked out, only the user who has checked it out can save to it. Multiple versions of a document can be compared and archived separately. 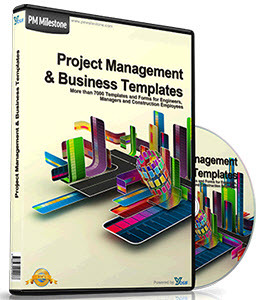 When a document is linked to a project or individual tasks, the most current version of the document is linked. 2 Click Collaborate, Documents. Or, on the Collaboration toolbar, click Documents. The Documents page appears (see Figure 22-37). Figure 22-37. 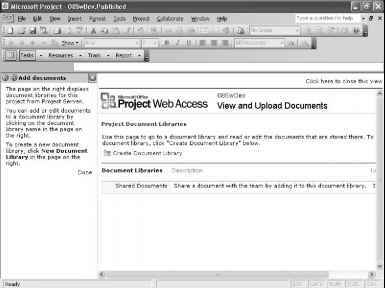 View and work with the document library from within Project Professional. 2 In the blue navigation bar, click Documents. The View And Upload Documents In All Projects page appears (see Figure 22-38). Figure 22-38. 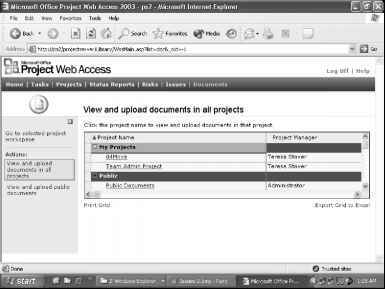 View and work with the document library from Project Web Access.